Here’s my pleasure trip on a boat made of Dhiman’s charm. It’s a conversation with fair parts of shadows. Some utterance piled up in the exterior of action, in the interior of reaction. I start engaging letters into the utterance. Alternatively I could say I start engaging words to my feelings. Sometime the words are word-illusion of me, sometime of the poet. I didn’t want any wall in between. Wall can’t be marked by water. There’s only engraving. An engraved wall is a history. I’m not writing a history anyway. I just want to implant words in my moments; the moment which is the indistinct whistle of nocturnal language; the moment which is the reflected light of the lost dew; the moment which is the unheard music of silent tears. The journey through this water-stair has created the space for me to reconstruct my own poems in an internalized language. In the process of reviewing Dhiman’s book, I wrote these poems, with a structure of combination of prose and verse, originally in Bengali, an Indian language. 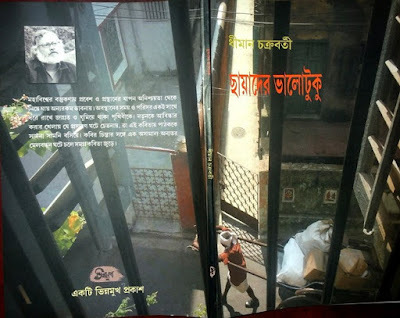 The Bengali version has been published in my review anthology, Tamoser Alokbhromon (Light-Travel of the Dark) published by Kaurab publication. Here I am presenting the translated version of it. Few poems from Dhiman’s book are added here in the second section, which are translated by the poet himself. Light keeps the darkness in its womb. Shadow plays hide and seek with them. Fair part of it engraves the light and shade on the cover page. A question rolls down into me… is my shadow follows me?.... is my shadow follows...... is my shadow….. I start my dark-trip with a missing warrant. Nilumwala’s tumultuous call inside my brain – light...light…light… Chokor came down from wicker-basket. Rimless delirium lighted her eyes. There’s a knee-deep indulgence at the darken doorstep. Sunlight of moon is in the interior of moonshine. Distance is so illusive that it looks like a voiceless notation on the magician’s finger. With a mild touch the butterfly-sleep comes down on my eyelash. The soft touch shows that the old cooing of cuckoo with an extended Phulgun has come down from moon. I set the cooing on my lips. The aqueous humor giggled at the back of cornea. I opened my eyes to see how the soil’s coating on the frame of shelter has been washed away silently. Again I start my dark-trip at the boundary of words, embraced by Dhiman’s charm, under the shade of fair parts of shadows. Love and fragments of sunshine take us a long way. Your second world walks freely with Riya and Labonya. The Phalgun with forgotten melancholy is ringing with the synthesis of left and right eyes. I have walked a long way with the reflected Riya from Swapan-beaker. Swapan has been bloomed in Riya’s eye with the rain-drenched Champak raga. Still I couldn’t turn the motion into any Labonya. You started the love-song in such a way that Riya becomes enlightened in unknown ambiance. In the pure light of rain-drenched evening there was boundless Labonya on her finger. The midday flew away with khul ja simsim. The lost finger slowly went away towards the parallel world leaving behind the first life. khul ja simsim - Hymns used to open the door in Arabian novel Alibaba and forty thieves. Champak – Bengali name of a flower. I know the story of your bird-life. It’s a story of dual-world. When the Light jumps from dimpled cheek of Madhobilata and walks down with a smile in company with Riya, your first world speaks out. When the windows fly away in the fog beyond the wall, your second world speaks out by wiping its own shadow. I always thought to join both the worlds, if I could find the static point of the source. There was no story of the static point. How it becomes myth during the settling process? Introspection recognizes the door of internal dissension. Everyday another world is forming behind that, which is the secret world inside me. Once upon a time a bird flew in the possibility of direction. Today she drowses whole day. The static point also flows down in the time-stream. It’s undecided. Our entrance and exit are marked by symbolic words. As if the serpentine motion spreading over time is just to slough off. As if the opposite attraction is just to change the position. North-Pholguni - One of the pair stars North-Pholguni and East-Pholguni; the twelfth of the 27 zodiacal stars according to Hindu astronomy. You don’t have any destination. Our too. Still there’s sound of flight on speechless wings. The universe is playing tumultuous silence. The parallel eyes dive into the ocean of words and bring the galaxy of zigzag movement. The door of the old-age-home with an engraved welcome invites on the way. The T-shirt plays blind-man’s bluff in the unidirectional motion of time and continuously chants the tune of youth-verse. The call of the door doesn’t reach to his memory-less inbox. As a result a melancholic evening creeps into the knee with decayed cartilage. The genome mystery, decorated in the cells of time, tells the story of winter’s smell. The changed curriculum with words and letters coats Komol-Maa over the wrinkles. You control the play of this paralyzed darkness by your finger. You bring them in the delighted meadow of nose-pin. Then the secret New Year sparkles in the human’s interior. When I turnabout from the excuse of fairytale, un-embodied words weave the song of cure on the nocturnal lips. The musical notation of imminent dawn sings the solar song. Flight is the name of sky; may be of love. Yet many persons couldn't hear the call of interior. As a result the feather-rain from sky remains beyond the vision. Wiping skylight the city is beautifying itself with decorated light. The feminine drinking glass is calling the disaster in the sixteen digits of moon. Oozing of the dancing mask intensifies loneliness. The breathing heart at the zebra-crossing can hear the sorrow of the torn sail, weep of the broken prow and the story of the wounded boat. The compassionate flute of Krishna blows by keeping its finger in the holes of the stories. Musical laughs fly towards the hints of light. The sky shades some feather. Love-song is flying towards the isolated cave. With its caress the lonely words becomes concentrated. You find the truth-speaking day by touching your tongue within water. Yet I feel all truths and untruths are prone to grammar; so much that I return from water again and again. The direction uncovered from the answer covers the unanswered. I see the truth hanging unsupported. I become daring some more with the sensitive touch of papyrus. When the flint-glass laughed at difficult motion and subject-less feelings of truth, the sun starts singing the musical notation with central light. And I move away from the centre from the spotlight. Gradually I enter into my dark cave, where your image tries to understand the utterance of the world. Slowly I enter into your world, where I could learn to be insignificant without getting wet. You told about light, few enlighten verse of Bhalopahar’s dawn-words. Opening the closed window of west I saw that all the lights went back. The science of light’s motion is not up to my thought. You have taught me the definition of straight line so many times. The straight line walks along the coast of love with the brighten world on its back. Touching the coast I saw that I couldn’t draw any line like that. Whenever I create a mark, they become the geometry of oblique movement. But the geo doesn’t have any obligation; metric doesn’t have any measurement perception. All my limitations reside in this ‘not’. You give shelter and nourishment to them. The hearts plucked from your finger sparkle the ocean-deep light of cure. Bhalopahar - Name of a hermitage of Kaurab-poets, situated in West Bengal, India. An important Bengali poet of this time, Dhiman Chakraborty was born and brought up in Kolkata. 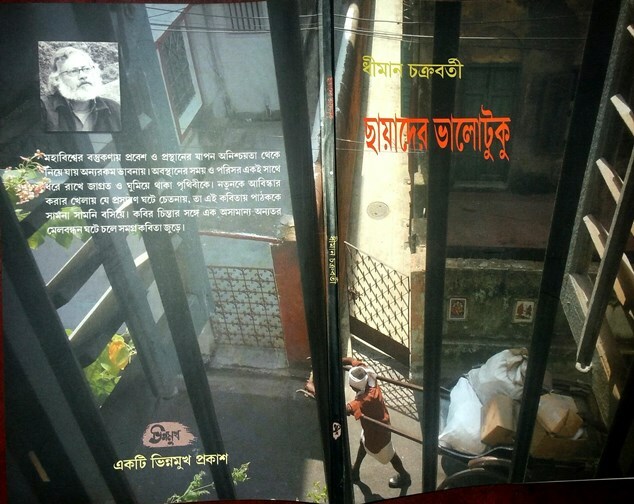 The first edited magazine by Chakraborty was Aalaap (Introduction / Conversation). In the year of 1987, his first book of poems Aapnaader Smarane (In the Memory of You) was published. After that, he authored several poetry-books. Aaguner Aaraamkedaaraa (The easy-chair of Fire), Chander Sapludo (The Jigsaw Puzzle of the Moon), Saadaa Aashroy (The white Shelter), Paakhider Robbaar (Sunday of The Birds), Sthanio Rong (Local Colour) to name a few amongst them. His poetry anthology Dhimaner Charaachar (The Universe of Dhiman) was published by Kaurab Publications in the year of 2008. He’s the editor of Bhinnomukh (The Other Face) for more than 15 years. Dhiman Chakraborty bagged many awards for different books. Dhiman is an iconoclast & he tries to destroy our traditional culture of language and words and in fact, he intends to surpass our age-old aesthetics with his different acoustics. with a scent of soap . Love and pieces of sunlight take a long way. how many fallow the path ? Grey hair is flying on the metal door. was never here --- alone . take its favourite lipstick . alarm-clock sits silent in front of it . few worlds within the school bag . come, let's celebrate his birthday . I'll sit beside him and sing along. of water and sadness . dangle a little the half-rocking chair . questions and some breath . I knot ten ends of water. to the prolong oxygen . counted the raincoats of life and death . is not being able to touch me . school frocks set on fire . spreads web on the bed . fasten you by the stories of fossil . shows the road to the carpet . calls on and on the delight of July . Ms. Runa Bandyopadhyay is an innovative Bengali poet, story writer and reviewer from West Bengal, India. She is working as Scientific Officer in Bhabha Atomic Research Centre, Mumbai, India. She focussed on alternative literary pursuits and experimenting with contemporary poetic language. She writes regularly in various Bengali Little Magazines. Her first poetry book Aseemer Khelaghor (Playroom of Infinite) is published from Kaurab in the year of 2011. After that she authored the poetry books, Nilumbala Chha Anna (Six penny of Hawker), Tamas Journal(Journal of the Dark), Poroborti Songbad (The Next News). Her review anthology Antarbarti Pangkti (Between the Lines) and Tamoser Alokbhromon’ (Light-Travel of the Dark) published from Kaurab Publication in the year of 2012 and 2017 respectively. She also authored collection of stories: Parankotha (Word of bosom) published by Sristisukh, and Benibandhan (Compact Braiding) published by Patralekha.